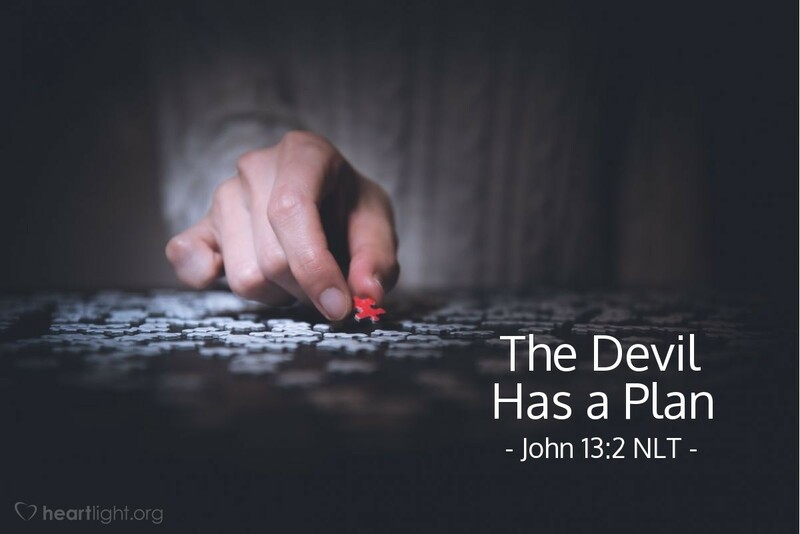 We must never forget that the events of the cross — from Judas' plan to betray Jesus to his opponents to the death of Jesus on the cross being mocked by the crowds — were part of the Devil's plan. More than entering a room with Jesus and his disciples in John 13, we have joined them on the battlefield. The evil one will not leave the events alone. He will orchestrate the hatred, jealousy, mockery, injustice, brutality, cruelty, betrayal, treachery, and death which follow. These things are also what he desires for all who seek God and goodness. Choosing Jesus is not only crucial; it is also a battle. Let's never forget that Jesus faced the Devil to win the victory for us. Lord God Almighty, my Abba Father, please give me the wisdom to see the crafty ways of the Devil as he seeks to deceive and to destroy my faith in you and my love for you. Strengthen me by your Spirit in my inner being so that I can be strong enough to face down my enemy when he attacks. Most of all, deliver me from the evil one and bring me into your glorious victory with great joy. In the name of Jesus, my conquering Savior, I pray. Amen.